Now that new bizz framework is stable enough for further theme development, I’ve decided to release long-awaited Restaurant theme that is as flexible as site building gets. You’re able to create as many menus, galleries, sliders, blogs … as you want, even on a same page. Place them wherever you like and have fun doing it. 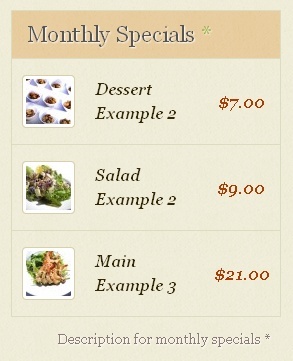 Build sites for local restaurants or for yourself in mere days. This theme also marks another milestone for as it’s the fastest theme, currently available on the market. I optimized every piece of code to the limit, so if you check theme demo with YSlow (Firefox add-on), you’ll see 93/100 mark. Test your current site against it and you’ll see the difference.